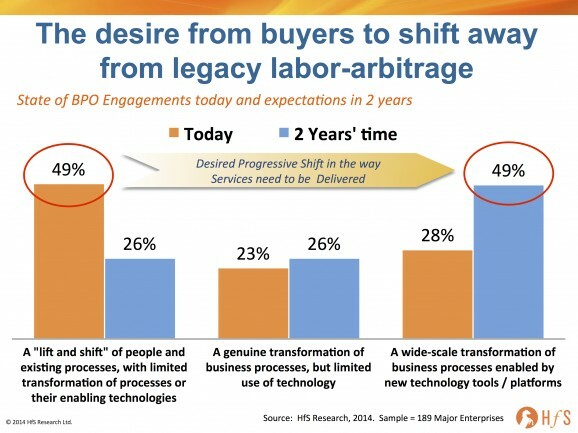 As I was finalizing client interviews for our forthcoming Blueprint on "Progressive F&A Services", my overwhelming conclusion is how unprogressive many of today's BPO relationships still are. To epitomize our findings, to quote one major enterprise client, "We worked really hard to move onto a transactional pricing model with our service provider - and they worked with us to achieve that outcome. However, once the service provider started taking a drop in revenues from us they insisted on moving back to the FTE-based set up." Now re-read that quote one more time - what does that tell you? Yes, people, some of today's service providers depend on the legacy effort-based labor model to keep their revenue numbers up. Having their clients shift to more fluid volume-based models is costing them money, and they don't like it. What's more disturbing here, is the fact that the profitability generated by the service provider is through the margins on selling the labor, not the margins on selling the services. Changing the legacy model does not sit well with some service providers, as pricing by FTE guarantees them a predictable rate of return, whereas innovating with the way services are priced and the risks/gains are shared, isn't doing them any favors. At least that service provider had tried to move its client away from a labor-arbitrage driven model - many other BPO clients are simply locked down in a perpetual status quo, where delivery is transactional and they are struggling to get them to change how they operate. Service Providers which ignore their clients' pleas for change and incremental value will fade away. Nearly all the clients I have spoken to this year have expressed a desire and determination to evolve their current BPO model beyond the transactional, and have the opportunity to share risks and rewards with their service provider. 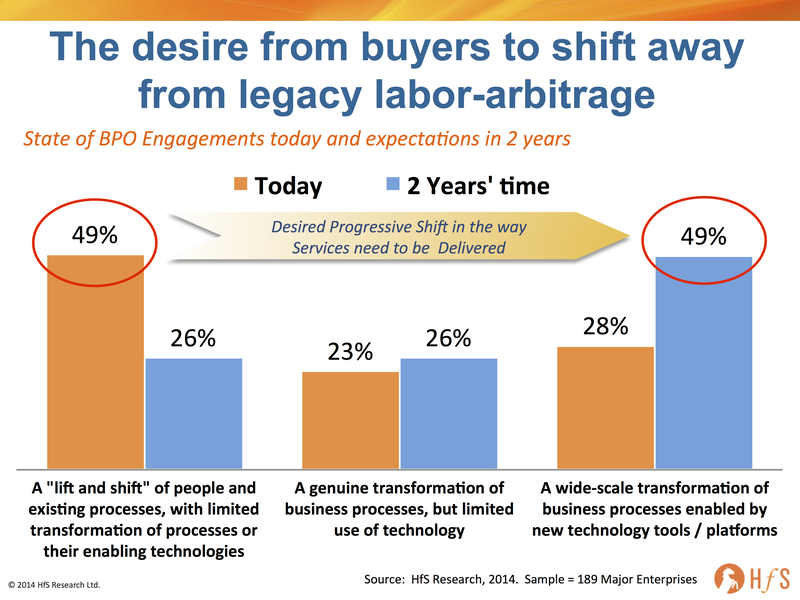 As the data above clearly illustrates, half of today's BPO clients actually expect to be in a transformative engagement where their processes are enabled by new technology tools and platforms, in barely a couple of years. This means if they do not reach this state, they will look at alternative means to achieve it. Many buyers will terminate their relationships once they realize there is limited future value to be gained. Here's the bottom-line: if service providers do not do what their customers want, they are toast. Wizening buyers seek advice constantly from advisors, analysts, other service providers, peers in other firms, and they see what is going on. They know the only long-term avenue towards continual improvement and value is by reaching out into the market to explore new provider partnerships, if their existing relationship has hit a ceiling for future value returns. (2) Technology-enabled BPO (BPaaS) solutions that can scale and be more profitable to both seller and buyer. These two levers above need to offset each other. The winning service providers need to figure out more fungible models where they can scale their top talent more effectively across their key clients, to help them use analytics, technology and automation more effectively to enable end-to-end process delivery and apply meaningful intelligence for their business leaders. Up until today, the service providers have grown through the land-grab of virgin clients - that's where the big money is - by sewing up new deals with all the trappings of revenue and profits driven by the offsetting of labor, transition and "transformation". Sadly for them, those days are fast-fading as most the big deals to be done, have now been done - the next wave of business for them is from deriving revenues from existing BPO clients. This is going to separate the wheat from the chaff, as it requires a different skillset to grow your client footprints than grab them in the first place. It's like getting past that seven-year itch when a married couple questions whether their relationship is worth maintaining - and 41% of first marriages do actually end in divorce... can a new relationship bring new delights to the table, new ways of looking at things? The next wave of value for the post-labor arbitrage enterprise is to reduce the reliance of manual labor and create value from SaaS-platforms analytics tools and other digital solutions. However, in order to create this value, service providers need to help their clients apply this technology effectively and reorient how their operational staff deliver services to be more aligned with the needs of the C-Suite. The smart service providers need to accept the fact that the big plump deals are going away and they will have to adapt to more consultative engagements, such as "operational excellence as-a-service" if they want skin in the next wave: The As-a-Service Economy... to be continued! Very insightful piece. It seems like this industry is stuck in an impasse -what do you think is going to change this dynamic? Very sharp observations. I am coming across the same observations in my current research in the Netherlands. When from technology point of view the obtaining of services on a p * q basis is becoming the new standard (...cloud...) then it is obvious that in the BPO/BPaaS space the same will happen in time. What puzzles me is if the retained governance organization will shrink or grow in these scenarios. And if this is already an element in the business case of BPaaS acquisitions. Apart ffom technology and analytics, it is essential for BPO providers and retained organizations to understand the impact of policies on behaviours. Eg. How do your sales compensation policies impact revenue and the behaviour of sales people. Another could be impact of revenue recognition policies on sales comp and hence behaviours and bottomline. It will be critical for service providers to understand polocies. Customers will also look for advice on compliance and best practices. Excellent insight. The comments about the relative ease of delivering value and earning margin in a first generation solution are spot on. If there isn't a step change in the solution - potentially through technology and analytics - then eking out marginal improvements is a dangerous game for providers with strong/savvy competitors that may market their 'x' generation solution better than the incumbent can continue to deliver strong enough ROI to keep the client happy. A very astute article. I do see this issue with potential terminations escalating. I see an increasing number of clients growing more and more frustrated that they have reached a limit with the value they are getting from their service provider. It also begs the question whether BPO is really only a temporary solution to take out cost, but the longer term value comes from better systems and processes. Agreed. Certainly in my research in off shoring within accounting firms, this leads to unrealistic expectations on both the client and vendor front. Success in off shoring needs to be based on a true partnership, with mutual benefits beyond labor-arbitrage. Are you sure it is the providers who are doing the hanging on? Maybe many clients prefer FTE based services (rightly or wrongly) ? Eight years of provider side experience and ten years of client side experience tell me that many clients lack the capability to buy and manage output / outcome-based services. 1) Technology - big shifts in the way operations are enabled, paid-for and delivered is when the technology is available to drive the change with a "standard" product that businesses could wrap themselves around. Look at what Office365 and Google have done to email; Workday to HR; ADP to payroll; Salesforce.com to CRM; Concur to expense management etc. Now we need to see more developments in standard F&A platforms offerings and many industry-specific processes (healthcare/insurance etc) that can be standardized and industrialized. Once the platform is standard, the service delivery is more predictable and the service value elements shift to organizational design, analytics, change management programs, end-to-end process enablement in complex global/virtual environments etc. 2) Disruptive providers - niche providers entering the market with completely different cost model to deliver platform-enabled services and much lower prices, but reasonable profit margins that are scalable across many clients. In addition, providers which have the skillset to carve out 20%+ additional efficiencies for clients using Robotic Process Automation tools and techniques. I predict we'll have a very different service provider landscape in five years' time - and there will be market leaders in there which may not even have been formed yet. 3) An economic recession - heaven forbid there may be one - the market's certainly overheating in several areas, and a sudden downtown could have a huge impact on services and the desire from enterprise buyers to rip "unnecessary" cost out of the equation. Many enterprises lack a burning platform currently... it may take one, not of their own creation, to drive the focus back to non-labor driven costing models and risk/gain sharing. A very good Read. This brings the memories of MBA economic class. Difference between price and cost. First the theory, Price refers to the amount of money that consumers have to spend to acquire a good or service, usually driven by market conditions. And Cost refers to the amount needed to produce a good or service. The FTE pricing model is how service providers “price” their services, and as long as there is a market – i.e. clients who are comfortable with (sometimes even prefer) FTE pricing, this model will continue. Term ‘Labour arbitrage’ is used as a price model, but essentially it’s a cost model. Even if the services are ‘priced’ differently (transaction based, outcome based or gain sharing), the fact that they are still delivered out of Bangalore or Pune means that Labour arbitrage still exist in 'cost'. The "unhappy with operations" camp. The still is a significant number of clients who are sill bemoaning the ability of their service provider to get the basic operational delivery right. They aren't anywhere near even contemplating moving to an "outcomes" model, or anything of higher-value beyond simply getting the current offshore team up to snuff. The "we're ready for the next stage" camp. This is an increasing bad of enterprises which are typically beyond 4 years (or more) into their engagement and are growing frustrated with the status quo. They are under pressure to find new ways to carve out more value from their operations, and one major way do to that is to de-link labor from their costs. With real advances in technology platforms, workflow tools, analytics and automation, ambitious clients are asking the questions - how can their provider take them new levels of improvement where they can reduce operating costs further, access more relevant/meaningful data and take a more holistic view of their end-to-end processes? What we're hearing directly from many clients is a growing frustration that their provider is either unwilling / uncomfortable or just plain incapable of shifting the model. If there's not new money in it for them, why would they want to? IMO the driver will be when providers have no choice by to shift towards more outcome-based models in order to prevent their clients jumping ship. At some stage an unwritten understanding seemed to be that what could be saved through automation has been or is being done. The next saving would come from reduction in the cost incurred on people-dependent processes. This is where large movements of business processes driven by labour arbitrage, enabled by advances in Telecom technology, started. Hence, growth of BPO has been closely linked with savings on manual processes. If more can be automated, it will always be done if it creates value. It is a free-market driven business after all. I still think that the barriers to adoption of output / outcome-based services lie both on the demand and the supply side. From experience, it take good data and high levels of operational and commercial skills on BOTH parties for this to work. For example, you need good process and service level definition, coupled with accurate baseline and forecast data. You also need both parties to adopt a pragmatic and interactive approach to properly define the as-is and to-be operating models. Hiding behind an RFP and a dogmatic TPA / Procurement-led approach is not going to work. Finally, you have to expect that client requirements will change over time, for example in terms of scope and volume, and the commercial and governance model and relationship needs to be robust and pragmatic enough to cope with this change. Unless both parties have this skillset, then sadly it's all too easy to concede defeat and conclude "hey, let's just buy some FTEs", which is seldom the best approach for client or provider. I have gone through primarily 3 kinds of outsourcing engagements- 1. No transformation, 2. Partial transformation,3. Complete transformation. In No transformation deal, it was the immaturity of both the client and vendor which resulted into a lot of noise in the engagement with both sides not being able to adjust to the immaturity of either side. The Partial transformation engagement was very satisfying since I saw the client trusting the vendor and allow the vendor to take initiatives to resolve issues in the system. A lot of trust had to be built between the client and the vendor and the client had to go that extra mile as well in investing into the growth of the vendor personnel understanding and create a relationship. I saw a sudden improvement in the engagement environment and forward and backward integration of the processes. The client was able to free their own bandwidth from pure process adherences to process innovations. The experiments was carried out at the vendor location and thus able to create value in inputting right workflows which were tested in the true shop floors. The benefits reaped were long term and very rewarding for both the groups. Fix price deals are far better to drive the vendor to challenge the existing systems and better them than the FTE or transaction based pricing. However the transaction number forecasting has to be very good and accurate. Identify the right talent in the vendor organization who have understanding of the business from the client side directly (in other words have worked in the client organizations and are not purely the product of the BPO service providers). This talent group is sensitized to the bsuiness challenges and is not purely dependent on loabor efficiencies to do business. I believe "trust" was mentionned on a couple of occasions and it does feel surprising that trust isn't at the menu when considering outsourcing. Or let's put it that way, it certainly is at the high level where the deal is negotiated. Problem: the sh... happens at the Operation level. Another point which would help: most clients have the arrogance to believe they master their process end to end. But they don't. There are cracks everywhere (system, process, people). Is that a surprise or a show stopper? Absolutely not. What is, is not recognizing that the client's house require a "bit" of cleaning too. As said previously, the outcome based system supposes clear processes and data, ideally data covering a couple of years to allow comparison, and last but not least clear roles & responsibility. All achievable if a shared effort. This is now especially true as more end users are setting up their own Global In House Centres (GICs) and taking direct advantage of the arbitrage. @John - definitely heightened interest in GICs, but more for industries with stringent regulatory procedures, such as banking and health insurance. Is your service provider genuinely investing in as-a-service capabilities? Insightful piece that service providers are hopefully reading. We have moved from an expectation of the on-demand future to an on-demand present. PaaS is increasingly prevalent and it will be interesting to see if the once emerging players of the past decade are able to adapt into this 'new paradign'. Phil's points about the caliber of the BPaaS labor force is particularly important as judgement and context, will supercede the rote ability to follow the scripted steps of commodity workflows and processes. It will also change the economics of these deals as human capital will become more expensive, thereby requiring a more robust, repeatable technology platform to offset the increase in human capital cost. 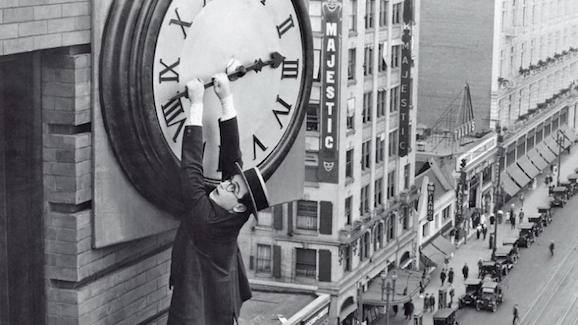 Let's not leap straight to the conclusion that the service provider is always at fault. In previous roles I worked with many clients to move from a per FTE price to a per transaction price. The hurdle we often faced was getting the client to accept that with risk must come reward. The stumbling block was all too often that the client wanted to offload risk but not share any reward. Another point would be a client's refusal to renegotiate a fair transactional price when circumstances changed that impacted anything from AHT to volume. The most successful relationships I worked with have always been those where there is a true partnership - a desire on both parties to see the other benefit. While that was always a part of the rhetoric it was all too seldom a part of the reality. @Connor - Firstly, I don't think the shift in the market is down to anyone's "fault" - we're simply moving into a new paradigm where ambitious clients can pull more levers to find the next threshold of efficiency and value form their operations - such as automation to remove subtasks and decrease reliance of manual inputs, better tech platforms to standardize workflows and drive out further inefficiencies, better analytics tools to mine more meaningful data etc. It's like when the lease on you car expires and you go back to the showroom for the new one - you will probably want the new add-ons like reverse camera, bluetooth, heated steering wheel, safety sensors etc. It's the same with sourcing - as new capabilities become available you will naturally want to lease them at the best price. The legacy services market is now commodity and providers need to get with the program or get pushed down the the lowest common denominator of delivery - cheap labor. Secondly, Yes it takes two to tango, but this is a competitive market and the client now has more choice - if one provider isn't delivering perpetual value, that client has every right to understand why not, and to investigate how to change the situation for the better. Many EDS, Unisys, IBM, HP, CSC clients went with lower cost Indian providers over the last few years because of the increased savings on offer - but the game really was still about cheap labor. Now the cheap labor is a commodity across all providers, the new focus is shifting once again - and we're still unclear about who the next wave of innovative providers will be in the "As-a-Service Economy" - it's still relatively early days, but signs are emerging. Your argument held water while the market was maturing and providers still figuring our basic operational delivery, but those days are fading fast and the new program is about incremental value. Atos and Xerox exchange holiday gifts&#8230; now can they disrupt a market that&#8217;s asleep at the wheel?